Love is the most beautiful and valued emotion, which is best expressed with a heart-shaped chocolate cake.Whether you are thinking to propose the love of your life or celebrating your first marriage anniversary, this melt-in-mouth chocolate cake is ideal to win the heart of your beloved. 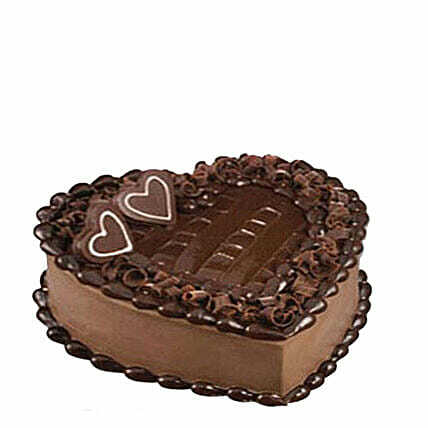 Order it online to offer a chocolaty delight to the person you hold close to your heart. "Every cake we offer is handcrafted and since each chef has his/her own way of baking and designing a cake, there might be slight variation in the product in terms of design and shape. Occasionally, substitutions of flavours/designs is necessary due to temporary and/or regional unavailability issues." "Store cream cakes in a refrigerator. Fondant cakes should be stored in an air conditioned environment.